The Spirit Tree Inn Welcomes You Back! Back to peace and quiet. To a sky full of more stars than you can count. To a place somehow both familiar and always new. Back in time. To a truly comfortable, welcoming place where body and spirit can be refreshed and beautifully, deliciously nourished. 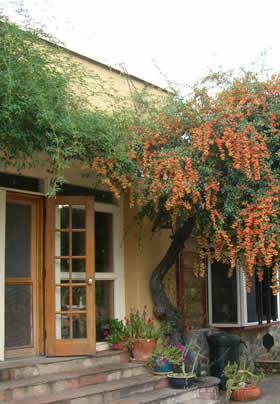 Our bed and breakfast in Southern Arizona offers an ideal setting, comfortable lodging accommodations, gracious hospitality and truly fine food to ease you into wonderful days, rested and nourished. 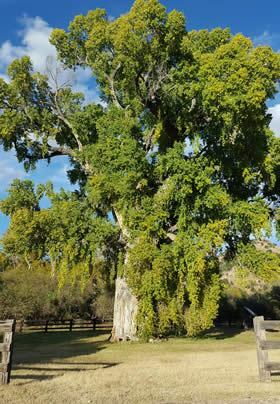 Our inviting Spirit Tree Inn sits on 52 private acres along one of Southern Arizona’s high desert creeks in the heart of the Coronado National Forest, three miles outside of the small town of Patagonia. We offer only six guest accommodations, so we do not bring you to a secluded place only to crowd you in with others. Our guest rooms and casitas are in keeping with the character of our historic buildings, which served as the headquarters of Rocking Chair Ranch more than 90 years ago – clean, unpretentious, and comfortable. Our 1830 Amish barn, brought from Chambersburg, Pennsylvania, adds another dimension to the property. Do you like to watch birds? hike? bike? horseback ride? or visit wineries? All these are activities that you can do here at the Spirit Tree Inn. You can bring your own bike or rent one of our Gary Fischer Mountain Bikes. We have two haul-in pens for your horses, and we are one-half mile away from the Arizona Trail. We don’t rent our own horses out, but guests enjoy petting them and giving them apple treats. The wineries, fourteen of them right now and counting, are open Friday through Sunday. Some are open all week and a few are open at other times with an appointment. We have two rooms that can be booked for one night. Birders welcome! This part of Southeastern Arizona is truly a unique bird watching area where you can spend many wonderful days finding many unique birds. Our Northern Cardinals can be seen daily as well as Canyon Towhees and Canyon Wrens. We have Black-headed and Say’s Phoebes, Acorn, Ladderback and Gila Woodpeckers. Many other birds can be seen in our patio and on the property. Other unique birding areas are within a short drive. Please call us if you would like to come to view birds on our property and you are not staying with us. Ask about local guides. Are you active or retired military? We have a discounted rate for active and retired Military. What better place to come for some peace and quiet, than Spirit Tree Inn? We have discounts for midweek and long-term stays too. Discounts are given only if you book from our web site or call for a reservation. They are applied at the end of your stay. We cannot honor discounts when the reservation is made through another system. Hunters are welcome also during the season. We have two dog friendly casitas available. Both with kitchenettes. Ask about local guides. We do family and school reunions, girls/guys weekends, weddings, retreats and just plain get-togethers. Please call and ask for more details. You can now book online or on your mobile device!!! Make sure you give us an arrival time, between 2 & 6 pm., and any food allergies or dislikes or special diets. Our gourmet breakfasts are geared to meet your dietary needs and at a time of your choosing. We also would like to know your special interests so that we can help you plan your stay. We made it through the holidays and beyond. We have been updating our rooms and gotten feedback from our guests. We had to change our reservation software as we wanted to stay in the USA. If you have any problems with it, please give us a call. Ask about our ongoing discounts that are applied at check out. These discounts are good when booking through our web site or calling for a reservation only. The birds are returning on their yearly migration. Please come on down and stay a couple of days. You will see many varieties in our patio and the surrounding areas. We would like to invite our past guests to return. Just let us know if you stayed here before and you get a 5% discount.